If you’re planning to grow your business then you’re going to want to look over and possibly revamp your e-commerce order fulfillment strategy. After all, it’s important to carefully plan all the necessary processes that you’ll need to upgrade in order to successfully complete your customer’s purchase requests. So, let’s dive head-on into some of the operations you may want behind your order fulfillment strategy. What’s is e-commerce order fulfillment? When it comes to owning a business the way you carry out your e-commerce order fulfillment is probably the most important thing that’s backing your company. After all, having your inventory fully stocked for customers, packaging the products they’ve purchased and then following through and shipping them around the world are just some of the behind the scenes processes that allow your business to thrive. Needless to say, which factors are the most crucial to consider? Even if you don’t own a brick and mortar shop, your physical location is still an essential part of your e-commerce order fulfillment strategy. If you’re hoping to meet your customers delivery expectations (costs, speeds etc.) then you may want to be based closer to your target audience. For example, if 70% of your sales come from within the United States, your operation base should be packaging and shipping items from there in order to maintain cost-efficiency. If you’re unable to relocate your warehouse to meet the demand, another strategic step would be to distribute your inventory to multiple locations within close proximity to your customers. Having the most innovative technology integration with make fulfilling your e-commerce orders more manageable. There are software and upgrades that can be integrated with various e-commerce platforms that can help you to manage orders across sales channels without requiring a manual upload. This means that as soon as an order is placed, the staff is then able to pick, pack and ship the items immediately to the customer. 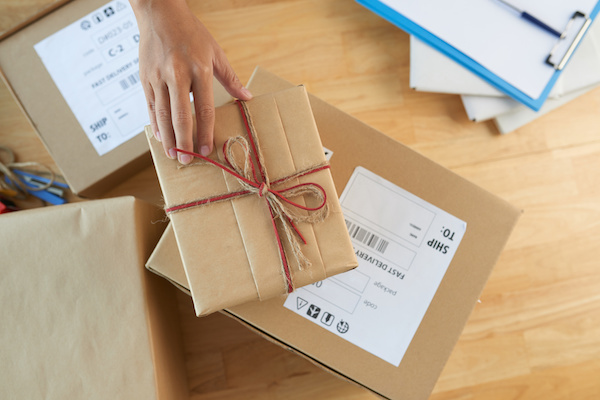 If you’re looking to amp up your e-commerce order fulfillment strategy, you may want to consider offering free shipping. While shipping costs are certainly not free for the merchant, offering nearby customers free shipping can help lessen your cart abandonment rates and get more shoppers to check out your page. Which order fulfillment model will you follow? In-house order fulfillment: As the merchant, you will be completing each step of the e-commerce order fulfillment process on your own. This will require you to secure warehouse space, recruit staff, purchasing the necessary equipment and inventory and more. Third-party fulfillment: This is when a third-party handle the timely elements, such as packaging, and shipping the orders. So, if you have no interest in managing your distribution then hiring a third-party carrier may be best suited to your business. Dropshipping: If you don’t have the money to sustain a warehouse and stock it with products, dropshipping may be a method that works for your business. The merchant is never required to hold onto the products they sell, instead, the products are produced, stored and shipped by the manufacturer to the customer. What e-commerce order fulfillment strategies does your business use and why? Drop a comment below to share with our readers.